When designing bespoke kitchens one key feature that we’re frequently asked about is advice on selecting the right kitchen worktop to provide good functionality but also a style that fits in with the overall design. From glass to granite and stainless to slate, kitchen worktops come in a variety of forms, each having its pros and cons. So how do you pick the best kitchen work top for your new kitchen ? Worktops are without doubt the work horse of any kitchen and can be subject to all manner of abuse so need to be both hardy and handsome. Sitting on the horizontal plane, worktops are highly prominent and want to nestle in with the cabinetry and the flooring. Over the past decade or so a whole new range of kitchen worktops have come on to the market giving us a wider choice than ever with pricing to fit all budgets. Technology has improved and now a new range of hardy almost indestructible materials are available. With open plan and living space kitchens becoming popular, more attention needs to be paid to choosing a material that complements the overall room. Luckily more luxurious materials are now available allowing us to offer you a far wider choice of surface than ever before. 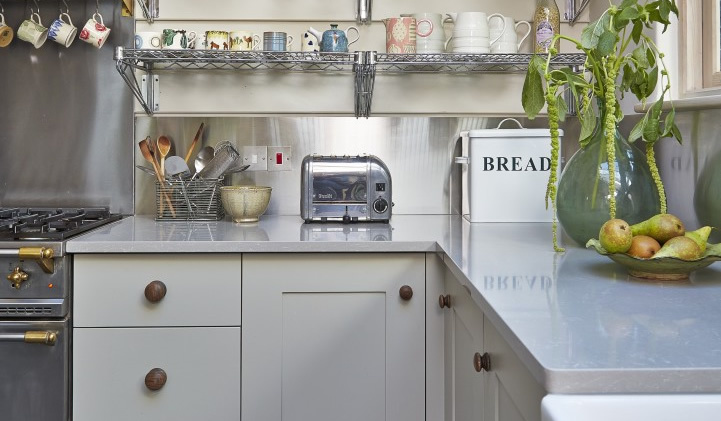 So where do you start when selecting the perfect new kitchen worktop for the dream kitchen ? Depending on the layout of the kitchen you are likely to need a mixture of straight runs for some areas and corners and curves for other parts. With many of the new composite materials seamless spans are possible making it easier to accommodate work top corners and curves. The standard depth for a kitchen worktop is an inch and a quarter or 30mm. But why be standard when you are designing a bespoke kitchen ? Once of the biggest considerations is appearance and the depth of the surface can have a surprisingly big effect on the overall look. Stone, wood and composite worktops can all be sourced in a variety of depths and with a choice of profiles. The term composite is often misunderstood; essentially it involves a mix of natural quartz crystals and a binding solution. Also known as engineered stone, composite surfaces are extremely hard wearing and require virtually no maintenance so are very popular for this reason. 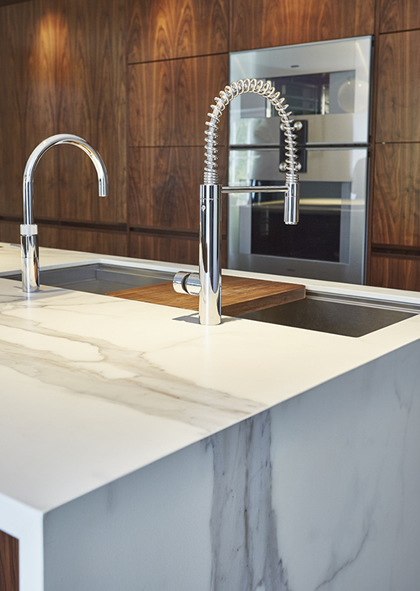 Because of their resilience to heat, water and chemicals such as bleach or lemon juice, composite surfaces are the natural choice for many when designing their kitchen. Depending on the style, composites come in a wide range of colours that will suit classic kitchens as well as modern and contemporary. Dark grays look great in the more traditional kitchen whereas other more bold colours including blues and whites suit the more modern design. Composite work tops also have the advantage of being thermoformed, which means that they can be created in any shape without joints, making for a long smooth seamless surface that looks great and won’t harbour any dirt nor germs. Stainless provides an industrial restaurant kitchen feel and is probably the most durable option available in the long run. Mainly used in modern and contemporary kitchens, stainless can be used alongside other materials such as wood to soften the look. 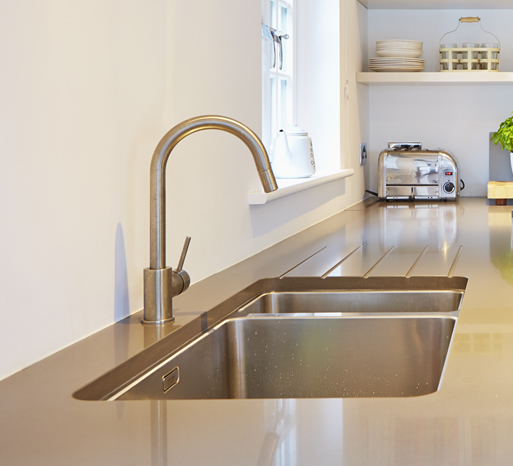 Stainless worktops are strong and resistant to heat, water and chemicals making for low maintenance. Scratches are not rare but can be treated with ease or left to give a worn look that fits in nicely if you are going for the industrial look. When it comes to fitting, stainless can incorporate sinks with ease and allow long unjointed runs that give the impression of space. 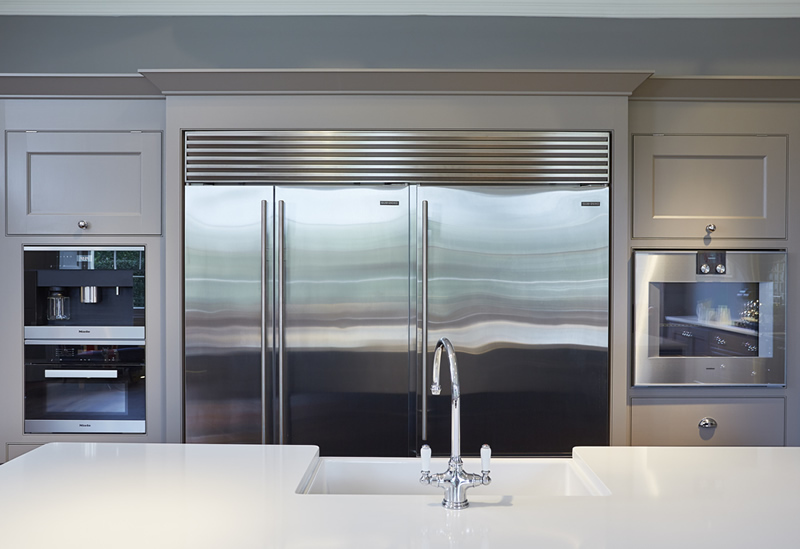 If hygiene is key then you won’t find a cleaner surface than stainless as it doesn’t allow bacteria to survive for long. Maintenance & up keep is key with a variety of different finishes to suit most – oil is client friendly however varnishes or lacquer require professional re-finishing when looking worn however do tend to last longer before any attention is needed. 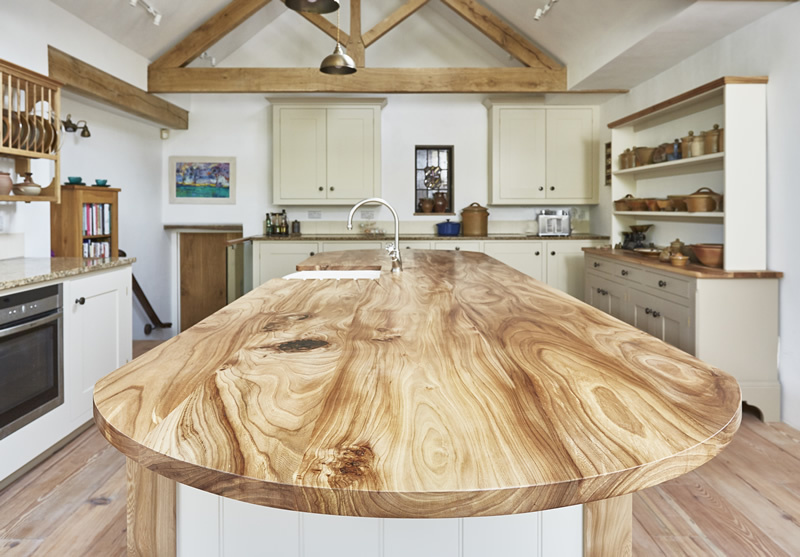 Your timber top will work hard for you however you need to be mindful about water and never leave any to ‘stand’ on the work surface. A good sink choice is key with a timber i.e. built in drainers and the tap hole within the sink not the worktop. Ideal for use in contemporary kitchens where natural light is sparse, glass worktops have the key advantage of reflecting lots of light that can make all the difference to an otherwise dark room or when space is tight where it can give the feeling of more space. Being non-porous, glass is a very practical material for use in the kitchen. Resistant to water, heat and most chemicals, glass can provide a very smart and hygienic solution. One thing to note when considering using glass for kitchen work tops is the depth which is realistically limited to 20mm making it half the depth of other choices such as stone or wood. One key feature of glass is the opportunity to use lighting to enhance the atmospheric focus. Typically lit from below, the edges of the glass provide a pleasant glow that defines the form and flow of the worktops particularly when used on curves and contours. Stone worktops are generally made from highly durable marble, granite or slate. Natural stone has an alluring look that can compliment most kitchen styles, traditional or contemporary. It is highly durable and as such can be used throughout the kitchen around sinks and alongside hobs where it can be exposed to water and heat without coming to any harm. Often used in kitchen islands, glossy granite is a favourite of ours at Barnes of Ashburton. Fashions come and go but stone worktops retain their attraction and never dropout of fashion. The only potential drawback of stone is the weight which can be a problem depending on the location of the kitchen and accessibility. Other than that it is perfect for most kitchens and can be cut and polished to give a very beautiful, hardy and low maintenance solution. We tend to associate concrete with larger structures like bridges or buildings but concrete comes in many forms and is now common place in the modern kitchen. Like stainless, concrete lends itself towards the contemporary industrial kitchen. When polished, concrete can provide a seamless smooth surface in virtually any colour thanks to pigments that can be added to the mix. Although incredibly strong, concrete can be prone to scratching and discolouration although finishing waxes can be applied to reduce the chance of any staining. 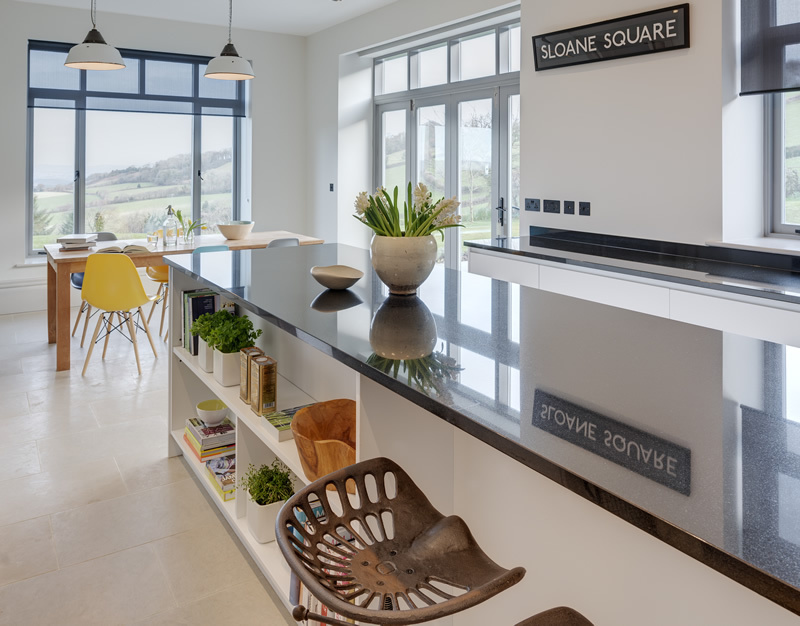 Remember when you come to Barnes for your new kitchen we help with all aspects of design, manufacture and installation of your kitchen and can offer advice that comes from producing hundreds of dream kitchens over many decades. So whatever your plans are, feel free to give us a call or come to our kitchen showroom where you can see the delights of having a bespoke handmade Barnes kitchen in your home.